Red River College (RRC) launched Pitch In, our comprehensive hallway waste and recycling program, in 2011. 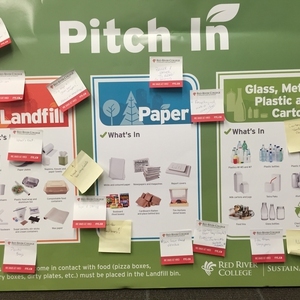 The program places trios of bins (1 for landfill waste and 2 for recycling) in strategic locations around the College’s hallways, many of which are accompanied by Pitch In signs explaining what items go in which bin. 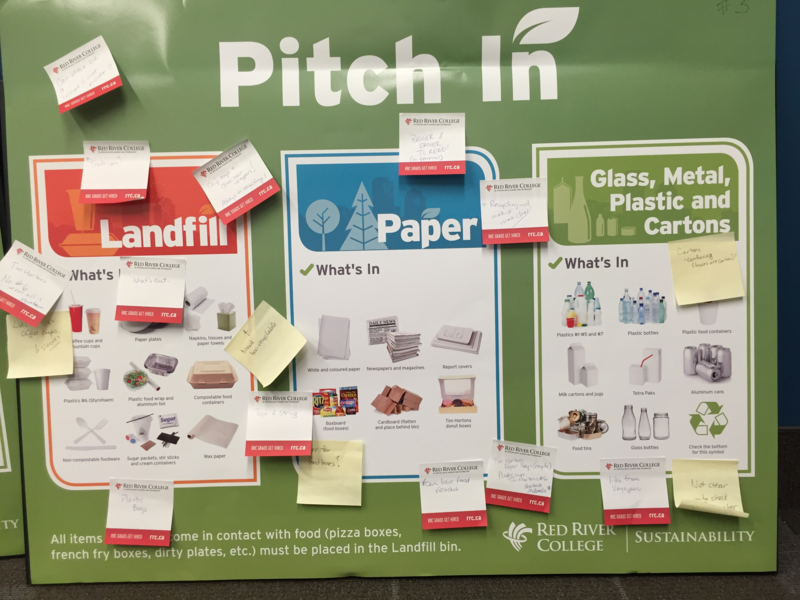 The concept behind “Pitch In” is two-pronged: it shows students and staff where to “pitch” their waste and recyclables and also reminds us that the program can only be successful if we all “pitch in” and do our part. Although there has been good uptake at the College on recycling, many items consistently end up in the wrong stream. In an ongoing effort to improve the effectiveness of this program, and to make signage more accessible to our users, the RRC Sustainability Office decided to redesign the Pitch In signs in 2016. In keeping in line with the Pitch In brand, we decided to invite our College community to “pitch in” on every step of the redesign process to make truly College-specific signs. To create an effective and accessible tool to help our staff, faculty, students and visitors sort their waste more efficiently. Our Pitch In signs are the main resource that people use to understand the waste and recycling programs on campus, so it is necessary that they are comprehensive and user-friendly. This project was designed to help us understand some of the key points of confusion or misunderstanding in terms of waste on campus which helped us not only design better signage, but also engaged our College community on an important sustainability topic on campus. To engage students in hands-on, applied learning in their field of study. Being an institution of applied learning, we strive to create opportunities for students to engage in hands-on, practical learning that will be useful in their future employment. Partnering with an Environmental Engineering Technology class to test out our draft designs achieved this while also giving us valuable insight to make our project a success. To create signage that helps connect people to our Sustainability office and is also College-specific. Our Pitch In program is also the primary contact point that the Sustainability Office has with the College community, making it an effective tool to direct them to our office to learn more about sustainability on campus. Designing our own signage internally also gives us the opportunity to create truly College-specific signage including images of items commonly found on campus (coffee cups, the student newspaper, etc) to not only make the sorting of waste easier, but to also reinforce our brand. To re-engage staff, faculty and students around issues of waste and recycling on campus. By partnering with a class on this project, and consulting with others departments, as well as individuals within the community, we wanted to not only get feedback on making the best product possible, but also to raise awareness about recycling issues in general and get feedback on our recycling program. Something that is unique about this project is the collaborative and academic components, engaging a wide range of the College community. This required many partners and a great deal of coordination by the RRC Sustainability Office, the lead partner on the project. The following is list of key project partners and a brief description of their role followed by an outline of how the project was implemented. RRC Sustainability Office The Sustainability Office manages the waste and recycling programs for the College, including the Pitch In program. Therefore, they were the lead on the project, bringing in the partners and coordinating all of the work. They oversaw all of the design work, performed the consultations, and supported the student project. Environmental Engineering Technology - Waste Management Course The Sustainability Office approached an Instructor in the Environmental Engineering Technology program about partnering on this project in order to provide hands-on, applied learning to students in his Waste Management Course. The students performed waste audits to evaluate key areas of concern for the Pitch In program as well as the effectiveness of the redesigned of the Pitch In sign and provided recommendations for the final draft. Building Services & the Recycling Team As the frontline workers who deal with the waste and recycling on campus, Building Services and the Recycling Team provided invaluable insight on the Pitch In sign redesign and timing of the waste audit. They were also key to the success of the waste audit by ensuring a 24-hour sample for each waste audit. Marketing and Web Presence (Marketing) Marketing worked closely with the Sustainability Office to create signage designs that not only incorporated all of the feedback but also maintained the brand and look of the Sustainability Office. They also worked with our office on a “garbage photoshoot” which took College-specific photos for the Pitch In signs. Recycling Hauler Our Recycling Hauler provided great insight into the Pitch In signs and clarified points of confusion on our recycling program. They also hosted a tour of their facility to interested RRC community members to learn more about the program and to answer common questions. Pavement and Grounds (Grounds) Grounds provided the space to perform the waste audit and also hauled the waste to and from the audit location. Pitch In Redesign Initial Consultation The original Pitch In signs were exclusively text-based, listing items as “what’s in” and “what’s out” under each material stream. In the first phase of the redesign, the Sustainability Office worked with Marketing to design three initial draft versions of the new Pitch In signs: one with just text, one with text and supporting images, and one with images and supporting text. The feedback was compiled and we worked with Marketing on designing a second draft of the Pitch In sign which was tested in partnership with the Waste Management course. The overwhelmingly popular design was the one with images and supporting text. Not only did people find this an easier and quicker way to identify items on the sign, but it was also pointed out that this would be more useful to the College’s many international students, for whom English is not their first language. One important priority was to present images that depict actual items you can get on campus. 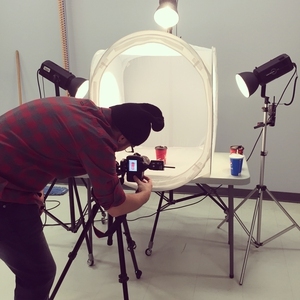 Therefore, we collected College-specific waste (coffee cups, College publications, take-out containers, etc) and held a “garbage photoshoot” with the Marketing department. Professional photos of these items were taken and used in the second draft. It was a funny sight to see different piles of garbage getting such professional photography treatment! Among the great feedback we received from our College community were questions around why certain items can or cannot be recycled, as well as what happens to our items once they are put in the recycling bin. 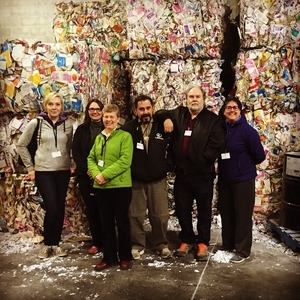 To answer some of these questions, we partnered with our Recycling Hauler who hosted a tour of their facility and answered any and all questions. Waste Audits The evaluation of the new Pitch In design was done in collaboration with students in a Waste Management class. The students performed a pre-waste audit of high-traffic areas in the College while the original Pitch In signs were up. After the first audit, the Pitch In signs in these sample locations were changed to the second draft and a post-waste audit was conducted two weeks later. The students were heavily involved in the planning and coordination of the project. The Sustainability Office met with them several times to get their feedback on the Pitch In draft design, to work together designing elements of the audits including timing, timelines, selecting sample locations, and determining audit categories. The students also met with Building Services and the Recycling Team to get their feedback on the proposed project and to get their support for the audits. 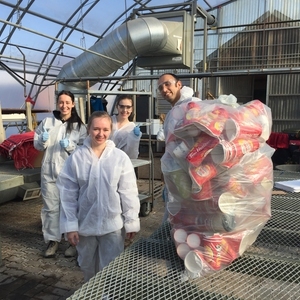 For both audits, Building Services and the Recycling Team helped the students collect 24-hours-worth of waste in the sample locations for both audits. The waste audits were conducted in a greenhouse on campus, in partnership with Grounds who made the space available and transported the waste to and from the location. The students compiled the data from each of these audits and prepared a report outlining key findings and making recommendations for the final design of the Pitch In signs. Pitch In Signs Final Design and Implementation The final phase of this project will include incorporating the feedback from the waste audits to create a final draft which will go out for final consultation. This consultation will involve connecting with key stakeholders such as Student Support Services and our Language Training Centre to ensure the final design is accessible and user-friendly. The final design will be printed and installed across all campuses over the summer with a final launch of the new design to coincide with the beginning of the Fall 2017 term. The most tangible outcome of this project will be the new Pitch In signs which will be installed across all campuses. This new design will be College-specific based on direct input from approximately 150 stakeholders as well as from the two waste audits which sorted through approximately 95kg (209lbs) of waste. The signs will also be College-specific with images of items actually found on campus. This project has also reinvigorated the discussion about waste at RRC, which led to the tour of our Recycling Hauler’s facility, but also has resulted in many discussions with members of the College community around recycling and waste issues in general. Another result of this has been that we are currently working on a compost program for offices. The students who worked on this term-long project got valuable hands-on experience in this field and plans are already in place with the instructor to make this an annual project. In speaking with a variety of stakeholders about the redesign, we received helpful tips and ideas we wouldn’t have considered otherwise. Some examples include: One person suggested switching the order of the bins, meaning people approaching from the left to right, would check the two recycling streams before they get to the landfill bin. Others gave valuable insight into clarifying areas of confusion such as whether a pizza box is too soiled to be recycled or whether the lids of disposable coffee cups were recyclable or not. Speaking with Building Services, the Recycling Team, and our Recycling Hauler who are on the frontlines of waste and recycling collection gave insight into common contaminants that need clarification on the new signage such as non-recyclable paper (paper plates, tissues, napkins, etc.). Student Support Services and the Language Training Centre provided important feedback ensuring our signs met accessibility standards and were user-friendly for everyone who comes to our campuses. The waste audit also gave us feedback and information that will help us fine tune the final design. Some examples of this include: The second waste audit showed items which are still causing confusion which we will try to address in the final draft. Based on stakeholder feedback, we switched the order of our trio bins, which we realized may have increased contamination based on people sorting items according to bin placement, not looking specifically for the correct bin. However, this was not the case. In fact, contamination in our container recycling bins decreased, indicating that people pay attention to the individual bins. Some surprising results included: we believed that milk cartons were often mistakenly placed in the paper recycling bin, instead of the container recycling bin. However, our waste audit determined that they are actually being placed in the landfill bin. We also expected that a high percentage of coffee cups were being incorrectly placed in recycling bins. However, we found that in the first audit nearly 92% of coffee cups were being sorted correctly. It is notable that this number increased to 98% after the new signs were put in place. Comparing areas with Pitch In signs versus areas without Pitch In signs, we learned that signage is only a small part of the equation. While some items that cause confusion had higher compliance rates in trios with signs versus trios without, many items did not see a significant difference in compliance between the two. This tells us that recycling signage is only one component behind recycling compliance and that more engagement and education is needed. Clear communication and timelines are needed. When coordinating several departments and stakeholders with different priorities and parts to play it is important to communicate very clearly about timelines, accountabilities and to give ample advance notice to each partner. Because we were working with a class, it was essential that their portion of the project be completed during the term, however this is also the busy time for many of our stakeholders, making it important to communicate needs clearly, often and well in advance. Decide the scope of consultation in advance, but be flexible. Consultation provided us with invaluable feedback that will vastly improve our end product. However, it we found that it is important to clearly state what is within the scope of the project when asking for feedback. For example, this project was not looking to change what items can and cannot be recycled on campus, only to communicate more clearly how to sort waste. However, we also found it useful to be prepared to hear feedback that is outside the scope and be flexible enough to act on it when possible. For example, we decided to have a tour of our Recycling Hauler’s facility to address some of the concerns and questions we received that were outside of the scope of our project. Build in time for evaluation. Unfortunately, due to delays on some areas, the evaluation portion of the project completed by the students was rushed. More time should have been built in from the beginning for the evaluation portion. If possible, span two different years or terms. While the results of the waste audit were valuable, they likely would have told us more had we done the project over two school terms, getting results from early in both terms before habits are made. Have fun. One of the most surprising things from this project is the reception we receive when we talk about our “garbage photoshoot”. People found it funny and interesting and it was a great way to engage them in the discussion.